Coming into the PayPal account? Thirty-two cents from Adsense, two dollars ninety-four from Adzerk. Going out of the Paypal account? Very different story. I had myself a little spree. It's SundayTuesday should be Sunday, and so it's Sunday Social time at Neely and Ashley's place, time to find out a little bit about each other. What would your answers be? Q: What do you value most in life? A: Time, especially of the alone variety. There is nothing as underrated as this rare, precious commodity. I cannot, in any sense, understand 'people who need people'. I don't agree with Barbara. They are not 'the luckiest people in the world'. The ability to be alone is a gift. I firmly believe that being able to be alone makes you a better person to be around (later). You. Yes, you. I don't think anything makes me a better person to be around. Well, maybe really strong valium and really strong alcohol that doesn't make you feel queasy. Q: What do you think is the greatest invention in your life and why? My theory is the Literary Junkies like talking about books so much that they sneak in 'monthly' check-ins more often than once a month. There is no physical way in the Universe that a month has already gone by since the last. Regardless of the warped nature of time, its folds and twists that make the linear seem shorter than it actually is, like the Norwegian coastline (guess the obscure literary reference to the Norwegian coastline—twenty arbitrary points if you do), it is time for me to explore books and their context to me for the last thirty or so days. Q: What are you currently reading? Tell us a bit about it! A different kind of day today. No outfit, no poll. No speel (nearly no speel). 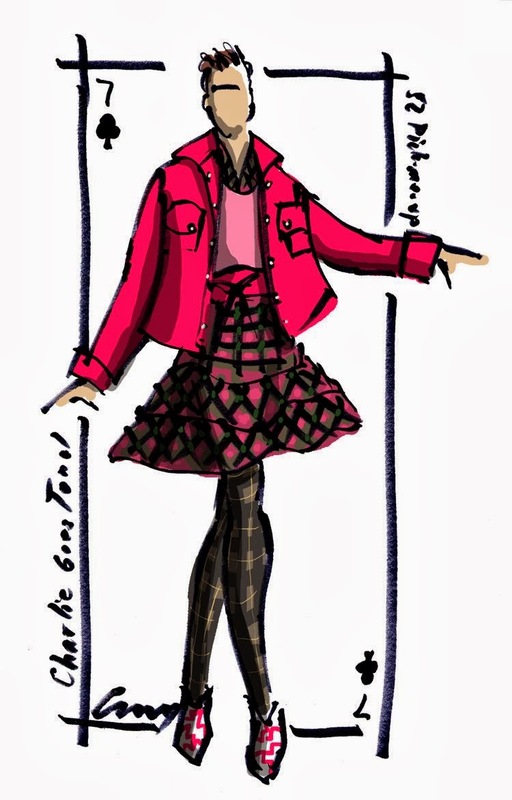 Today I am celebrating the honour of having been immortalised in sketch by the amazing Spy Girl. I join the elusive and heady ranks of fashion-exciting ladies such as Bella at The Citizen Rosebud, Melanie at Bag and a Beret, Desiree at Pull Your Socks Up, Senora Allnut and so many more. And so Irene could also participate, I got out my pencils and Spy-Girl-ed her too. There is definitely no 'Who Wore It Better?' today, and unquestionably no 'Who Draw it Better?' either. I don't like that level of rejection. A different kind of day to the usual story over here at Fur Earwig. I hope you all don't mind. Thank you so much Anne! Yay, new words! Wouldn't the world be an amazing place if every week you could learn new words and new punctuation? Too nerdy? Wonderous Word Wednesday this week (I'm a tad late) is based on the three god-y books I am reading at the moment: American Gods, The Book Against God and The God Delusion. It's just a co-incidence that they are all on the same subject this week and I was surprised that most of the words are actually from the fiction rather than what I thought would be the more difficult-to-read non-fiction. Turns out Richard Dawkins is talking down to me in a perfectly comprehensible manner so far. And—spooky—the main character in American Gods is named Wednesday (= Woden = Odin). Synchronicity. I keep dreaming of building houses. Amazing labyrinthic houses with (reading) nooks and hidden rooms, secret doors and cellars, vistas off the end of long patios, fireplaces standing alone in the middle of rooms. The hidden room one nearly had me up with a pencil and paper to work it out—hexagonal, multi-level, with a reading/sleeping platform close to the glass roof so you can watch the stars. Have I been thinking/reading/seeing too many lighthouses lately? I need that room. Maybe it's a sign; maybe it's time. Let's talk Feminism. Are you scared? This is not going to be a(n overtly) serious conversation. It's just that sometimes it is the littlest of things that topple the biggest, like termites, or a small drip, over time, on a large rock. Subtleties can belie bigger and bolder endeavours and maintain a status quo without anyone ever realising it. And in this category sits the squiggly red line of 'misspelt' or 'not-known' words in Microsoft Word. One of my (male) literary professors sneered in disbelief when I was silly enough to suggest this out loud for the world to hear, so now, just between you and me, I'm telling you that squiggly line represents a continuing dominance of the patriarchal. And I am sorry to seem harsh, but if you don't believe me, you are fooling yourself a little. The fight is no where near over. And this is one of the battles! Goddammit!! The best ever year of SYTYCD is over. There were tears. Like they said, there was no way to choose a winner badly (although I would have loved it if Jasmine had won). Tears fell out of my eyes, but I grinned and cheered for the whole show too. It was stupendous. Pure, amazing entertainment! Goddammit!! There is a serious plot error in Dan Brown's Angels and Demons. I found it. I double and triple checked it and I thought I added it to this blog list of mine (lots of 'works in progress' on that blog). But I thought wrong. And it seems that no-one else has noticed it—there are lots and lots of blogs about all the other errors in that book, but not the one I found. All this means I have had to add another book to the pile, because now I have to work it out again! I am going to wear white outerwear and dark innerwear more often, and hang out in front of white surfaces. It gives the illusion of smallerness, although slightly odd-shapedness. I lost a whole bum in that photo. Things that make me feel cosy. That is the List-de-ma-jour today on Meet me at Mikes. What make's you feel cosy? It seems fairly universally to rotate around bad weather, beds, warm drinks and rugging-up. Have to think outside the square on this one to get something interesting—my attempt is below. Leave me your ideas of cosiness in the comments. Day 253: Do I Talk About Books Too Much?